Our roadways need more love and less blood. People are needlessly dying and getting seriously hurt. Many cities have started prompting road users to share by adding "sharrow" insignias on streets where dedicated bike lanes don't yet exist. However, many drivers and even cyclists still don't know what a sharrow is (see here). Yet, we all know too well the death, injury, or rage, that can result when cars and bikes fail to share the road. To boost awareness, please post pics of sharrow love on Instagram, Twitter, Facebook, Pinterest, Google+, etc, with the #sharrowheart hashtag. If you want this reflective sticker to put on a car or bike, just comment on this post. Show everyone possible that many of us already have a #sharrowheart and it's growing. I'd love a sharrow sticker! (Or two if that's not greedy - one for car and one for scooter) How can we get one? Hey Robert, just send your address to jbrooks@planbike.com. Hey Corey, just send your address to jbrooks@planbike.com. The sharrow is an excellent roadway marking to raise awareness that cyclists belong in the travel lane. 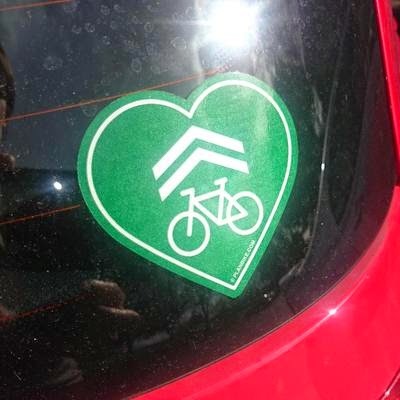 The heart sharrow sticker is a great tool to spread the awareness throughout communities that have sharrows on the road. The R4-11 signs Bicycles May User Full lane is a superb adjunct to the sharrow and is supported by the MUTCD. During an interview with Khaleej Times, Sophia said: "The notion of family is a really important thing, it seems. "I think it's wonderful that people can find the same emotions and relationships, they call family, outside of their blood groups too. El abogado de los pilotos Cesar Romero y Johan Jiménez, condenados a 30 años de cárcel, dijo que su caso cumple las exigencias para que pase a la JEP y que las Farc engañaron a la justicia. Saudia Arabia is one of the world's most oppressive states for women, and only last month lifted a ban on female drivers. She addressed the audience in English without the customary headscarf and abaya, a traditional cloak which Saudi women are obliged to wear in public.